You'll be £10.00 closer to your next £10.00 credit when you purchase 1805 Austerlitz. What's this? The Battle of Austerlitz is almost universally regarded as the most impressive of Napoleon’s many victories. The magnitude of the French achievement against a larger army was unprecedented, the great victory being met by sheer amazement and delirium in Paris, where just days earlier the nation had been teetering on the brink of financial collapse. In this insightful study, the author analyses the planning of the opposing forces and details the course of the battle hour by hour, describing the fierce see-saw battle around Sokolnitz, the epic struggle for the Pratzen Heights, the dramatic engagement between the legendary Lannes and Bagration in the north, and the widely misunderstood clash of Napoleon’s Imperial Guard and Alexander’s Imperial Leib-Guard. The author has produced a detailed and balanced assessment of the battle that for the first time places familiar French accounts in their proper perspective and exposes many myths regarding the battle that have been perpetuated and even embellished in recent books. With 1805: Austerlitz, the reader is left with a thorough appreciation of Napoleon and his Grande Armée of 1805, an army that decisively defeated not a hapless relic of the ancien regime but rather a formidable professional army that had fought the French armies on equal terms five years earlier. A most worthwhile account and an excellent choice for a reprint. 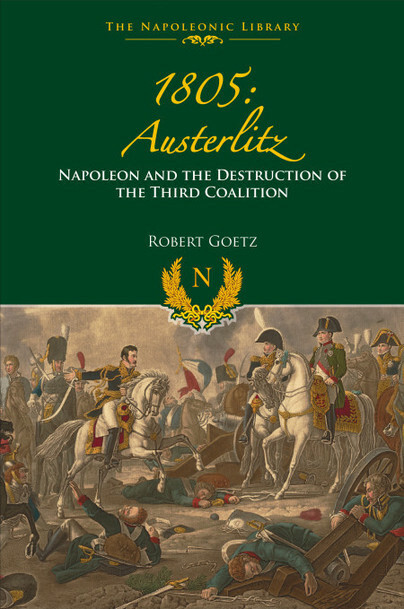 For his work on this book, Robert Goetz was awarded the History Grand Prize of the Paris-based Fondation Napoléon in 2005. Awarded annually, the Grands Prix are presented to the best works of Napoleonic literature. For 1805: Austerlitz, Robert was presented with the award for the best non-French language publication.